Synthetic full method — Veeam Backup & Replication synthesizes archive full backups using restore points on the target backup repository. Active full method — Veeam Backup & Replication copies data for archive full backups from the source backup repository. The synthetic full backup is the default method to create archive full backups. Veeam Backup & Replication does not copy data for archive full backups from the source backup repository. It synthesizes archive full backups from backup files that are already stored on the target backup repository. This approach helps reduce load on the network and production environment. To use the synthetic full method, you must leave the Read the entire restore point from source instead of synthesizing it from increments check box not selected in backup copy job settings. The synthetic full method is not recommended if you use a deduplication storage appliance as a target backup repository. Performing a synthetic full backup on such repositories requires additional time and resources to download and decompress backup data blocks. HPE StoreOnce and Dell EMC Data Domain use virtual synthetics. Veeam Backup & Replication creates archive full backups by virtually synthesizing data blocks from existing backup files. ExaGrid uses adaptive deduplication. Veeam Backup & Replication creates archive full backups from existing backup files that are stored in complete form in ExaGrid high-speed cache. 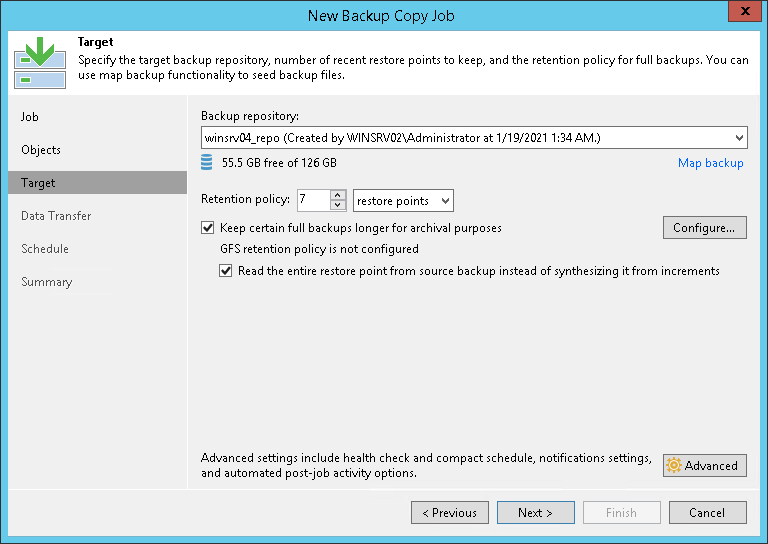 You can instruct Veeam Backup & Replication to create archive full backups (backups retained by the GFS scheme) with the active full backup method. The active full backup method is recommended if you use a deduplicating storage appliance as the target backup repository. Active full backup helps improve the backup copy job performance and reduce the load on the target backup repository. By default, Veeam Backup & Replication uses the synthetic backup method to create archive full backups. However, synthesizing archive full backups can cause problems with storage performance on deduplicating storage appliances. Deduplicating storage appliances are optimized for sequential data access. The synthetic backup creation, however, takes random I/O operations — Veeam Backup & Replication reads data from existing backup files and writes data to the synthesized archive full backup file. As a result, the storage performance can degrade. In addition, backups reside on the target backup repository in the deduplicated and compressed state. Before creating synthetic full backups, Veeam Backup & Replication needs to download and decompress data blocks of backups, which requires additional time and resources. To optimize the backup copy job performance on deduplicating storage appliances, you can enable the Read the entire restore point from source instead of synthesizing it from increments option in the backup copy job settings. Veeam Backup & Replication will copy data for the archive full backup from restore points on the source backup repository, transport it to the target backup repository over the network and write it to the archive full backup file. The load on the network will be higher but the performance of the deduplicating storage appliance will increase. If data transfer does not fit the backup copy interval, the backup copy interval is extended.